Drop7 is a really addictive little game – ONCE you realise (and work out) how to play it – I taught Fi it too – it’s addictive. WWF as it is affectionately known is Words with Friends – much like scrabble – and absolutely better in every way – I have the ad free version on my phone – it is also available to play on Facebook – but there is no way to remove the ads – so it’s pish!!! iPhone version wins all the time!!!! So – the blog seemed to have taken over my bedtime reading/playing – but I may fit a wee WWF and a Drop7 in before sleepy . After all – i AM back to work tomorrow!!! 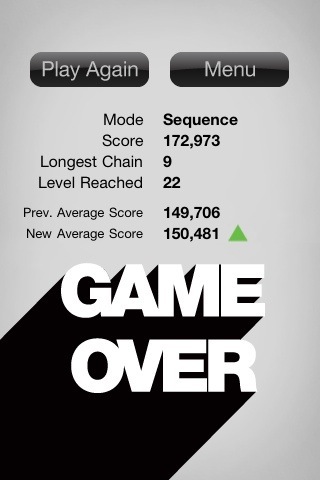 I don’t think ‘addictive’ is a good enough description. What word would mean ‘more than addictive’. 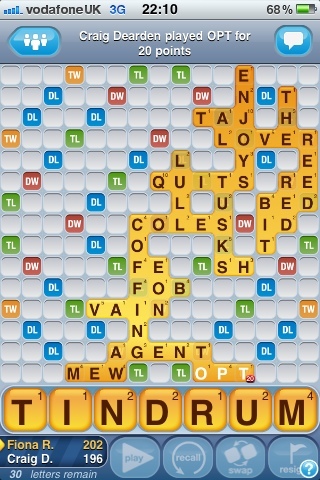 It was bad enough being taught WWF, then you had to bloody go and teach me Drop7!!! You have a lot to answer to Mr Dearden! I did however have a good snigger when I saw your wwf tiles up there!! Brilliant, yet spooky!